What is Enstella EDB to PST Converter? 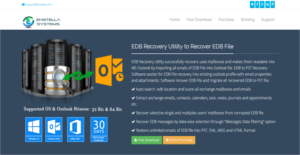 Enstella Systems EDB Recovery Utility is an EDB Recovery solution that retrieves or recovers mailboxes and transforms them into PST format, making them readable into MS Outlook, It does this by importing all emails of EDB File into Outlook file. EDB to PST Recovery Software helps with the EDB File recovery and then moves and saves them to an existing MS Outlook profile. With Enstella Systems EDB Recovery Utility, users are able to recover, convert, and save all their mailboxes into PST format with all their email properties and attachments intact. That means users of the software never have to worry about losing data during the recovery, conversion, and migration process. Enstella Systems EDB Recovery Utility ensures that all recovered data is complete and unchanged. Enstella Systems EDB Recovery Utility makes it easy for you to search lost or forgotten EDB locations and files, thanks to its Auto search .edb location functionality. With it, you can quickly and easily scan all exchange mailboxes and emails. The software is also designed to effortlessly extract exchange emails, contacts, calendars, task, notes, journals, and appointments among other things. The software allows for the selective recovery of single and multiples users’ mailboxes from corrupted EDB files. Its capability of selective mailboxes recovery can be based on user’s performance. Once scanning of corrupted.edb files is done, all the emails or mailboxes are displayed in the left panel of software based on the user’s needs. Enstella Systems EDB Recovery Utility can be set to extract only the attachments if you are looking recover them instead of retrieving the whole email. You can also specify the period that you want to recover. For instance, you can set the “starting date” and the “ending date”, Enstella Systems EEDB Recovery Utility will only recover EDB files and their attachments within that specific period. This functionality saves you precious time by only recovering emails and properties that you need and want. Aside from saving your EDB files to PST, this recovery tool can also convert EML, MSG or HTML format depending on your need. It is easy to choose the format and then save your recovered files in the format you want. Extract exchange emails, contacts, calendars, task, notes, journals, and appointments etc. What Problems Will Enstella EDB to PST Converter Solve? • JET_errRecordNotFound, the key was not found”,”Jet_errRecordDeleted”.Server Specific Error 4294966781 equates to JET_errInvalidLogSequence. The log files are out of sequence. • Unable to initialize the Microsoft Exchange Information Store service. Enstella EDB to PST Converter software firstly eliminates every error and then proceeds to fix the damaged or corrupted EDB file in order to convert all its items included emails, contacts, calendars, task, notes and appointments into new created PST, EML, MSG and HTML format. There are trendy and widely used solutions in each software category. But are they automatically the best fit for your company’s special needs? A popular software application may have thousands of customers, but does it present what you need? For this reason, do not blindly invest in popular systems. Read at least a few Enstella EDB to PST Converter reviews and consider the aspects that you desire in the software such as the fees, main tools, available integrations etc. Then, shortlist a few systems that fit your needs. Check out the free trials of these platforms, read online opinions, get information from the maker, and do your homework meticulously. This profound homework is sure to assist you choose the finest software platform for your firm’s special wants. How Much Does Enstella EDB to PST Converter Cost? Site License installed on multiple computers across the globe. We realize that when you make a decision to buy Document Management Software it’s important not only to see how experts evaluate it in their reviews, but also to find out if the real people and companies that buy it are actually satisfied with the product. That’s why we’ve created our behavior-based Customer Satisfaction Algorithm™ that gathers customer reviews, comments and Enstella EDB to PST Converter reviews across a wide range of social media sites. The data is then presented in an easy to digest form showing how many people had positive and negative experience with Enstella EDB to PST Converter. With that information at hand you should be equipped to make an informed buying decision that you won’t regret. What are Enstella EDB to PST Converter pricing details? What integrations are available for Enstella EDB to PST Converter? If you need more information about Enstella EDB to PST Converter or you simply have a question let us know what you need and we’ll forward your request directly to the vendor.